What does an Etymology book and Vases have in common? On the Friday we celebrated my husband’s 53rd birthday, which in my books is a terrible time of the year to have a birthday. For people like me who already hate shopping, to make me go out again, right after Christmas, well you may not receive exactly what you hoped for. Now I do try to find the perfect gift (see last paragraph), I listen to comments you make throughout the year, so when I’m shopping I can readily find it. A week or so before his birthday, my husband mentioned he liked vases. Now in my defense, this was not the first time he has said this, we have numerous vases throughout the house that are his, not mine. 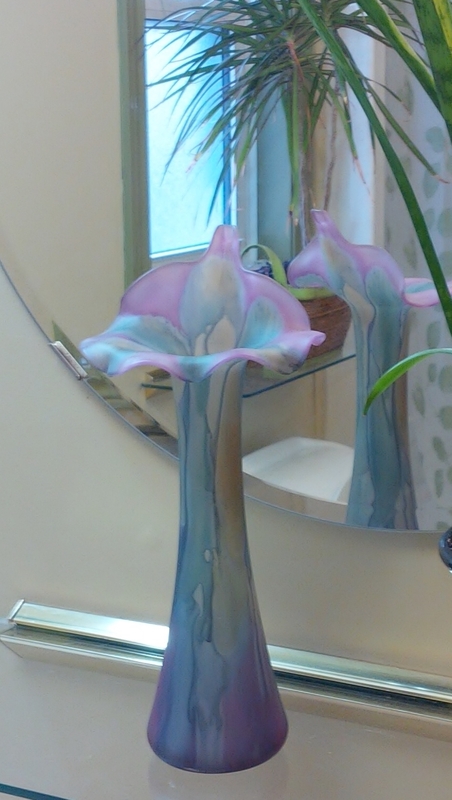 I am not a collector of things, and certainly not vases (I do kind of like the one hubby bought me years ago, but if I was shopping I would not have purchased it). Vase hubby purchased for me years ago. …and he didn’t like it. I thought it was pretty, the stained glass effect, but no matter how many descriptive words I could think of and say, he still didn’t like it, and apparently the eldest didn’t either, since her comment was “I don’t get it when you die”. Being a very good sport, I did not get upset, even when he said “it reminded him of a trophy”. I had already sent a picture of the vase to middle child, who definitely did not like my choice either. Hubby then sent a picture to the young man, who immediately phoned his dad and said something to the effect of “WTF”. Next the young man phoned me, his comment “that’s perfect the etymology book lives on!”. The Book of English Etymology. 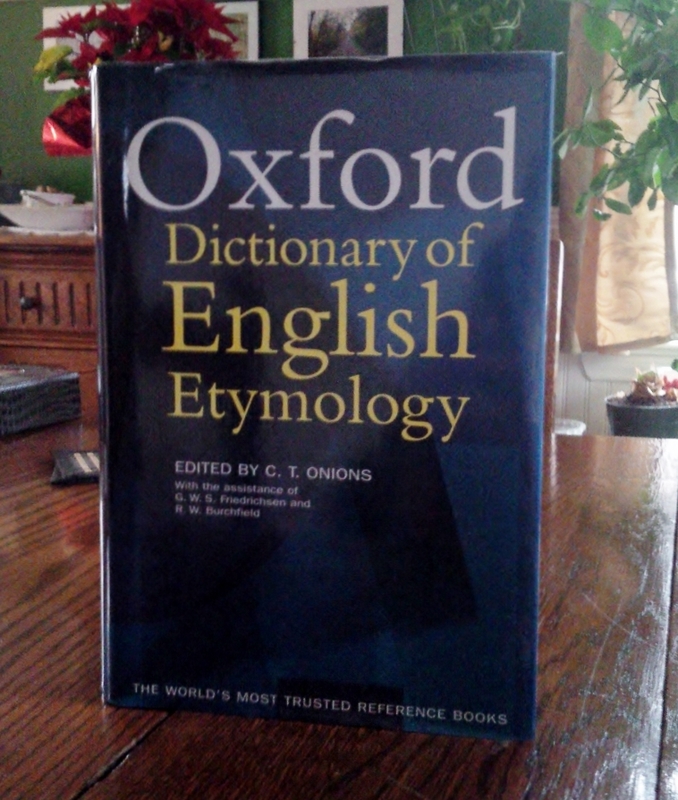 One Christmas years ago, I had given my husband a book of English Etymology because I was 100% positive he had mentioned that he would be interested in having such a book. He, of course cannot remember this conversation. Since then all my children have questioned the reasoning behind buying such a book, and whenever I buy a gift for someone, this book comes into the conversation. What do you think? Do you like the vase? This entry was posted in Birthday, Book, Books, Christmas, Christmas Presents, Dictionary, English, Etymology, Gifts, Humour and tagged Present, Presents, Presents, shopping, Stained Glass, Vase on January 19, 2015 by AlwaysARedhead. I have to tell you , I like it! 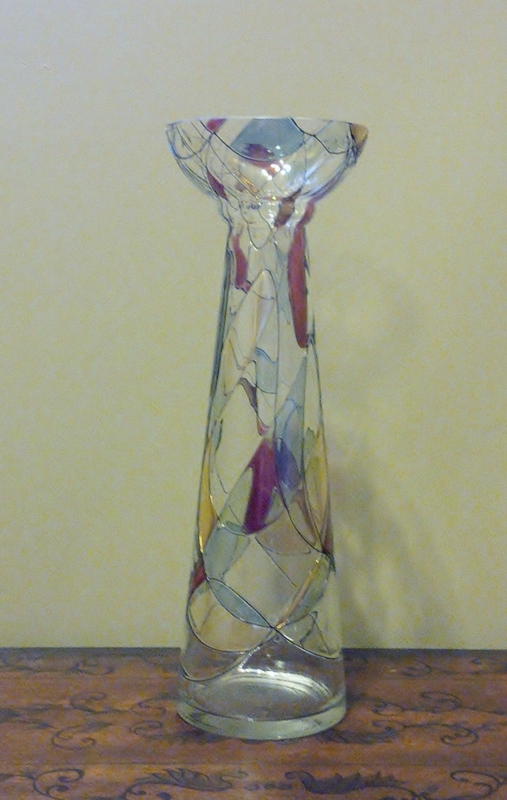 The vase is still in the house. He hasn’t said whether or not he will keep it. I’m more afraid of what he will buy me for my birthday in April. lol, I hope not! We actually disagree on everything, we don’t really like similar things. How we have remained married all these years is a miracle. I did not say “WTF,” I said, “oh my god, you were right” – in reference to his text earlier in the week, saying how he regretted mentioning a vase because he was certain you were going to get one. Hello son, dad told me you said something to the effect of “WTF”, it’s quite alright though. Thank you for reading my blog and commenting. I love you. BTW, I like the screen name you have chosen. I love the vase … and I either have a copy of the aforementioned Oxford Dictionary or something similar. Ah, do you use the dictionary? So there is hope my husband may one day look at his Etymology book? Yes … but please remember that I used it when technical writing. Sorry about that. … so suggest your husband look something up the next time the questioning son comes home. lol, the questioning son, I like that. Did you happen to see, the young man read and commented on this post? Yep … he jumped right in to challenge the specifics! I think it’s pretty! The other one, the one that he bought you is very pretty too. I’m glad you can laugh about it! Laughing has kept our marriage together for 28 years. It’s quite alright Lottie, I have a thick skin, lol.